Kalmasoft Interoperable Justice System (KIJS) as an interoperable service oriented archtecture framework for judicial systems. An interoperable framework to host legal and law practice application software designed to run in a cloud environment. KIJS system supports activities of the various courts linking them together with the rest of the judicial organs and institutions providing the possibility of interoperability, availability, and scalability. 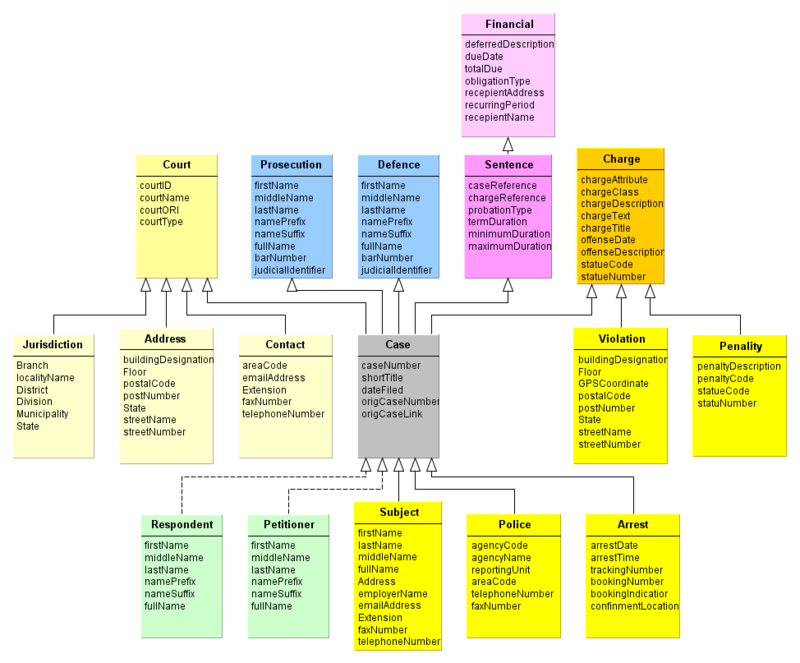 KIJS depends on a clear structural stack of layers each defines specific category of systems, services and types and judicial activities related applications, the stack diagram above also indicates where should be the 3rd party commercial applications and how to manage and control them by the other system components. Performance is a key factor in this configuration where functional specifications of the system is dependent from the underlying technical details. The service oriented architecture of the framework ensures an effective way of interconnectivity between all kinds of law practice institutions and other institutions whether governmental, civil, or even individual through highly engineered set of web services. The various blocks depicted in the diagram above is just a sample of many possible ways the system can be configured, a much wider system can be developed based on a similar framework just by adding pieces and horizontally scaling the infrastructure. 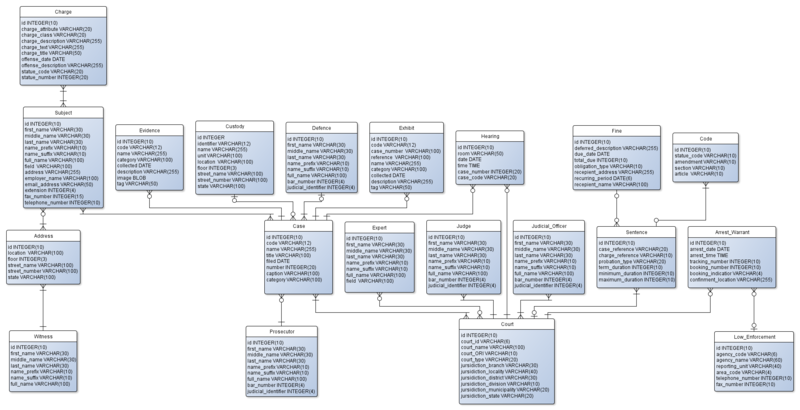 KIJS takes into account the fact that courts have a continuing flow of information in form of documents which are persistently keep growing for indefinite time, the system has comprehensive and descriptive techniques that cover all current and future needs of such contents, the figure above shows a brief portion of the structure of the basic database showing the entity relationships of a model court case, organizing information this way ensures reusability and integrity. KIJS represents court cases in an abstract method (Abstract Model Document) that is appropriate for all regions regardless of the language or or any geographical considerations; laws and procedural complexities are left to the different software applications that are adopted by system. KIJS includes a comprehensive structures for each possible inter-court procedure workflow, linking the different courts and judicial bodies supported by the system, application categories like case management systems, court e-filing systems, court scheduling, and court document archiving systems are connecting to the system through web services. The system is designed based on highly descriptive data flow regarding litigation procedures and court systems in all most countries, the diagram above shows the basic steps required to bring a case to the civil courts, this is the ideal situation for litigation but the system supports more complex cases that come in all arrangements such as the proceedings found in the cases of multiple court levels that include different case statuses. 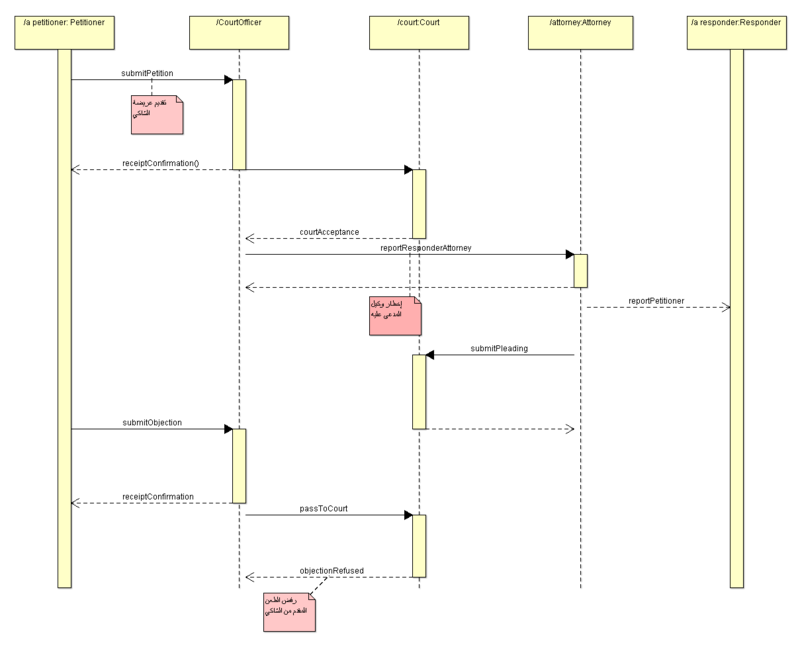 Advanced tools been used in system analysis and design for all possible scenarios for the court proceedings, the figure above shows the logical paths of a model petition processed at the system level, the above procedure in particular is effectivly implemented using web services in the court level based on logical action taken by each of the litigating parties; this flexibility comes due to the standardization of information exchange that significantly reduces the design complexity of the applications to be adopted by the system. Applications that are adopted by the system fall in many different categories ranging from browsers that support access to public information to the specialized software used in management of more complex situations in courts like court case management systems, legal assistant systems for judges and prosecutors; those application are open to third party developers, the only restriction is to pass the quaity assurance stack shown in the figure above, once passed the application is fully certified and simply qualified to use KIJS services, an example of third party application is Alustad detailed here Alustad. Document Generation of Indicments, Notices, etc. Your inquiries are most welcome! Is there any annual license fees to use the system? Yes, the cost of running the system are distributed between different applications which are very complex to manage. Is the system ready to use once installed? No, unfortunately this is not a standalone centeralized computer software, KIJS is cloud framework governing how adopted applications can be utilized within the judicial system in the country meaning that the system needs other multiple services to effectively start to function. Does the system runs exclusively in the requesting client's country? KIJS is independent of political entities. Does the system support multilingual environments? Yes, the system is independent of the language, all adopted applications that support multiple languages can be run according to the specifications. What is the difference between the law practice system and other systems now avaialable of the same category? KIJS is a collection of the best of similar systems used in the EU and the United States. Does KIJS support interconnectivity and interoperabilty? Yes, the system is designed to be interoperable and supports horizontal scalability and easilly integrates with the other e-government systems. What if we want to return to the paper-based environment? Depending on the adopted applications KIJS is not designed to dispense with paper but works in an environment that support both electronic and paper. Interoperable framework for judicial systems implementing various technologies. Design on SOA architecture and supports modern cloud technologies (SaaS, NaaS, SAN, HTML5, IP6) to host different applications. Independent of geographical environment and includes all the necessary standards of judicial procedures in most countries of the Middle East and Africa. Multitenant and independent of all application software and data formats, this means total flexibility in deployment of various subsystems and user applications. Implements a highly precise quality assurance system for hosting software applications, this ensures safety and efficiency in the enterprise framework used by the judiciary in the country. Designed to work in an integrated environment including systems similar to egovernment subsystems. Modular design applicable to all levels of courts and seamlessly integrates the whole judicial system with other governmental and civil circles in different ans dependent layers.